In the interests of making sure you all look your most gorgeous, here’s a quick round up of what’s new on the high street and internet – there’s so much! Hurrah! You can now purchase Origins from Boots.com and I heartily recommend the Go Modern collection in the Winter White Sale. It includes my beloved Perfect World serum and moisturiser as well as the Checks and Balances face wash and Modern Friction scrub, both of which I’ve tried and loved. All for the bargain price of £27.50 but with a value of £61.91! It’s a introduction to a fantastic skincare regime. There’s also a 3-4-2 deal on selected No. 7 products but to be honest, I’m a bit out of the loop on the range. Go for your life if you’re a fan though! Has a neverending parade of beauty to tempt you… I love the celebrity secrets page and it’s so good to know that all of my favourite brands are under one roof and deliverable overnight! Stila, BeneFit, Urban Decay, Pout, Paul and Joe, gorgeous. Sigh. I recently had to buy in a last minute birthday present and went with the Philosophy A Few Good Men lipbalm set. Delivered next day, giftwrapped and super cute – I love this site! NYC is a) named after my favourite city and b) a bargain cosmetics brand on sale through Superdrug and while I haven’t tried these products myself, they’re making some pretty hefty claims. The new loose powder, £2.99 is apparently on a par with Clinique’s blended face powder – want to let me know what you think? beautymecca@gmail.com I can’t wait to try it. 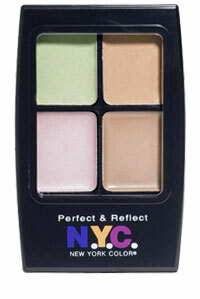 I quite like the look of the concealer palette though. It’s great to be able to blend your own tones and anything that can be manipulated to fit my awkward skintone is good news to me! And it contains a highlighter. NYC, you’re spoiling us!